I absolutely love moments like this. There is nothing like the thrill of being a photographer and knowing you have captured such a meaningful image. I can remember knowing that I had this split second of time captured as soon as I pressed the shutter release on my camera. I have always taken a photojournalistic approach to my wedding photography, showing what happened, not something staged or set up by a photographer. What is so special to me is when you give someone an image and it makes them cry. It takes them back to how they felt during that moment and brings back a feeling. This image gives me a wonderful feeling and you can imagine an even greater feeling for the two subjects. Photographs need to have a certain integrity associated with them and certainly do not need a dreamy, starry-eyed interpretation. This image was taken by my Canon 1D Mark IV camera at ISO 1600 with an 85mm lens at an aperture of f/1.8. 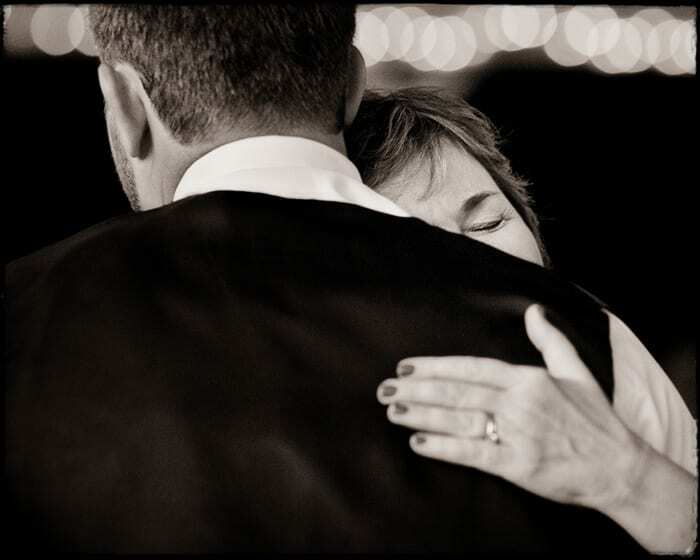 It gives us a wonderful shallow depth of field and allows the viewer to concentrate on what is important…..the mother as she dances with her son…..nothing more, nothing less. I love simplicity in photography and often its a challenging piece of photography for one to grasp and it can often be the toughest to capture.